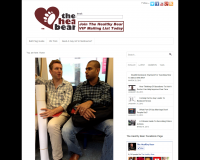 The Healthy Bear is a website aimed to share medical information and empower gay men to take control of their health. With regular updates I share men's health topics including sexual health, mental heath, and general medical issues pertaining to the gay men and those who care for them. Melbourne Rapid HIV Tests a website to promote rapid HIV testing within the Melbourne CBD. This website has proven to help bring in new clients for my clinic as well as being an education portal for those wishing to learn more about HIV, risks of HIV as well as HIV testing protocol.